This combination offers enough capacity in larger locations to give the vending operator less trips back to refill. 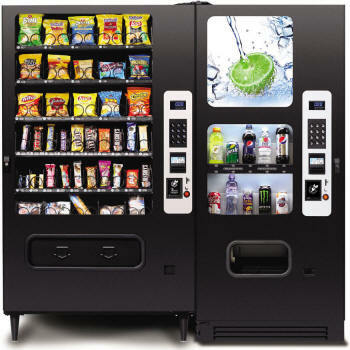 The MP40 snack merchandiser comes equipped with a vend delivery sensor system to guarantee that your customers receive their purchase or get their money back. The BC10 beverage merchandiser can vend a huge variety of cold drinks, and its removable illuminated display makes it easy to brand or customize the machine sign. Together, they make a winning vending solution for larger locations. *Capacities vary depending on packaging. BC10 *671 lbs. (304.4 kg) *Varies with options. MP40 *516 lbs. (234 kg) *Varies with options.